H.E. Kentaro Sonoura, Special Adviser to the Prime Minister of Japan, praised the existing relations between the Sultanate and Japan, stressing the two countries' efforts to develop and strengthen them in various fields. During his visit to the Special Economic Zone in Duqm (SEZD) on 3 September 2018, Sonoura stressed the depth of the existing relations between the two countries, and noted the results of his visit to the Sultanate. He indicated that the purpose of his visit to SEZD along with his accompanying delegation is to explore the investment opportunities available there. "We know that SEZD is strategically located. We are looking at investment opportunities and we will evaluate each project separately," said the Japanese Prime Minister's Advisor. The Japanese delegation includes H.E. Kentaro Sonoura, with 28 members from the public and private sectors in the fields of tourism, natural resources, energy, infrastructure and transportation, as well as representatives of a Japanese commercial bank. For his part, H.E. Yahya bin Said bin Abdullah Al-Jabri, Chair of the Board of Directors of the Special Economic Zone Authority in Duqm (SEZAD), called on the Japanese side to invest in Duqm, highlighting the interest that SEZD enjoys at the local and international levels. Al-Jabri stressed that SEZD is witnessing the implementation of several economic projects within the Sultanate's plan for economic diversification. During his reception of the Japanese delegation at SEZAD building, Al-Jabri explained the incentives offered by SEZAD to investors including tax exemptions and various facilities. He explained the unique geographical location of SEZD, pointing to government investments in establishing SEZD infrastructure and the most important projects currently under construction. The visit of H.E. 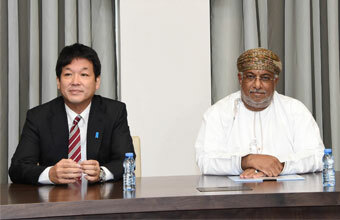 Kentaro Sonoura, Special Adviser to the Prime Minister of Japan, to SEZD came as part of his visit to the Sultanate aimed at strengthening political and economic relations between the two countries. The visit included presentations on SEZAD, Dry Dock, Duqm Port and the projects executed by the Oman Oil Company, such as Duqm Refinery, Oil Storage Station, and Gas Delivery Project to SEZD. The presentations addressed SEZD potentials and efforts to market and promote it locally and globally. H.E. Kentaro Sonoura and his accompanying delegation visited the dry dock and listened to an explanation of its potentials in the field of ship repair and the company's plan to diversify its fields to various industrial sectors. The delegation also familiarized themselves on the potentials and main components of Duqm Port.